You are at:Home»About Succulents»Is it a Thanksgiving, Christmas or Easter Cactus? Around the holidays, we often see blooming plants that are members of the Cactus family. One of the most popular plants to give or receive during the holiday season is the Christmas Cactus. Or is it an Easter or Thanksgiving Cactus? These 3 species of cacti, know as Holiday Cacti, are members of the group called leaf cacti. The plant bodies are flattened and the leaves are actually stems. The flowers are produced from notches in these stems or from the tips. The fuchsia-like flowers last a long time. They are usually pink, but modern hybrids include white, red, yellow, and purple varieties. There are reports of plants being handed down from generation to generation and being over 100 years old. The main difference between the Thanksgiving, Christmas Cactus and Easter Cactus is the time of bloom. As their common names suggest, a Thanksgiving Cactus can bloom in late fall, one month before the Christmas Cactus. The Easter Cactus starts producing flower buds in February. Regardless of type, there are steps to follow to ensure bloom. The difference is found in the shape of the leaves too. The Thanksgiving Cactus (Schlumbergera truncata) has very pointed and claw shaped projections on the edges of the leaf. 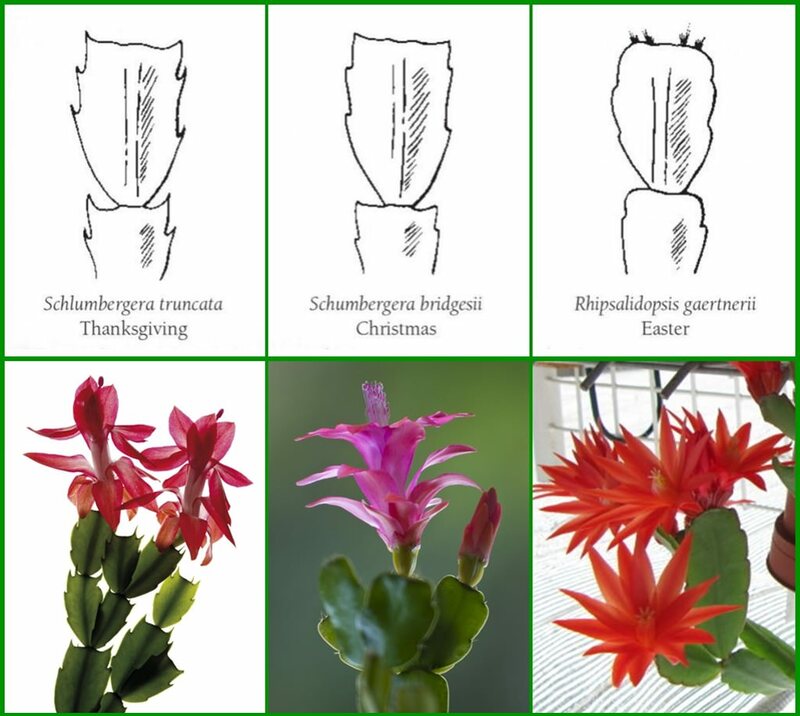 The Christmas Cactus (Schlumbergera bridgesii) has leaf projections which are more scalloped or tear drop shaped. The Easter Cactus (Hatiora gaertneri, formerly known as Rhipsalidopsis gaertneri) has very rounded edges which are centralized on the leaf. All of these three cacti are known as short day plants. So in order to induce the plant into bloom it must have 12 to 24 hours of darkness and cool temperatures. If you have over summered your plant outdoors or purchased it from a florist or nursery the plant should be kept in a cool location and in a dark area until it sets buds. A seldom used bedroom or lower level is the ideal place. The Christmas and Thanksgiving Cactus require approximately 6 weeks of short days in order to bloom whereas the Easter Cactus requires 8 to 12 weeks of short days to bloom hence the name Easter Cactus. When the buds appear it can be brought into a warmer area for your enjoyment. Sometimes a plant might start to drop buds at this time. That could be due to drafts, too-warm temperatures, too much water or direct sunlight. The plants enjoy bright light but not direct sunlight. The soil should be dry to one inch (2.5 cm) below the surface before watering and not fertilized or repotted while blooming. The plants seem to do the best when root bound. The Christmas and Thanksgiving Cactus may re-bloom again for you in the spring but not as profusely as holiday time bloom. If you want to encourage spring time blooms, simply return the plant to its short day conditions. These plants are relatively disease free unless over watered. If the plant turns reddish in color it is an indication of too much sun, lack of phosphorus or lack of water.